On the eve of the centenary of the outbreak of the First World War, I thought it would be fitting to chart the influence of the war on Bella Casey, the heroine of my novel, The Rising of Bella Casey (Brandon, 2013). Bella (b.1865) was the eldest of the family of five, which included Dublin’s premier playwright Sean O’Casey. 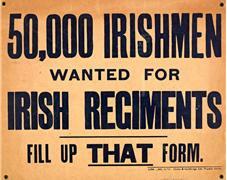 The Protestant Caseys, and Bella in particular, were steeped in the tradition of service in the British Army. Two of Bella’s brothers had soldiered with the Army. Tom Casey saw active duty in the Boer War (he died in February 1914 ) and Mick, who had served in the Royal Engineers in the 1890s, re-enlisted in 1915. Bella’s teenage son, James “Sonny” Beaver, also joined the Royal Navy in 1915. Bella’s husband, Nicholas Beaver, had been a career soldier with the King’s Liverpools regiment in the 1880s. Beaver was struck down with the mental effects of syphilis in 1905, and was committed to Dublin’s Richmond Asylum where he died in 1907. Bella was left destitute with five children to raise alone. Her brother, Sean O’Casey, being an avowed socialist and staunch nationalist, would not have served in the British Army on principle but he often drew on his background of solid, working-class Protestant loyalism for his work. He might not have had personal sympathy for these beliefs, but there was no doubt he understood them. Although he was fearless in tackling thorny political issues in his plays – the depiction of the Easter Rising in The Plough and the Stars, for example, caused riots in the Abbey Theatre when it was staged in 1926 – it was to take O’Casey almost a decade to approach the horrors of the First World War. In 1928 he submitted his play, The Silver Tassie, to the Abbey Theatre. It constitutes a different kind of war service, an unflinching polemic on the futility of battle. In the first act we see Harry Heegan, a young Dublin sporting hero who plays on the winning team for a soccer trophy (the silver tassie of the title) on the day he is due to return to the front. The second act of the play is an operatic depiction of Heegan and his war-weary comrades set in the rain-soaked trenches of France. A ruined monastery forms the backdrop; a broken crucifix dominates the scene. Strange liturgical chanting mixed with parlour songs replace conventional dialogue, in a highly stylized rendering of the absurd horrors of war. Nothing in the play up to this prepares the audience for this daring expressionism. Acts Three and Four bring us back down to earth, but all has changed. Heegan, now confined to a wheelchair as a result of a war wound, returns to Dublin, embittered and disillusioned. His girlfriend has gone off with his best friend Barney, who has won the VC for saving Heegan on the battlefield. In the community where he was hailed once as a hero, he meets only bafflement and distaste. No one can understand the trauma he’s been through. This is so common a trope in war narratives now that it is barely remarkable, but at the time, it was a revolutionary perspective. Director and founder of the Abbey, W.B.Yeats, and O’Casey’s friend, was not convinced, however. He turned the play down out of hand. In the history of literary rejections, they don’t come more savage than this. Yeats claimed that O’Casey knew nothing about the First World War: “You have no subject,” he wrote, “You are not interested in the Great War, you never stood on its battlefields or walked its hospitals and so write out of your opinions. . . ” He dismissed the bravura second act as an interesting technical experiment; after that, he added, “there is nothing”. Given O’Casey’s strong and enduring family ties with the British Army, Yeats’s accusation that O’Casey was not familiar with his subject matter could hardly have been more wrong. O’Casey was not a man to take such criticism lying down. He inquired tartly if Shakespeare had been at Actium before he wrote Antony and Cleopatra or visited Philippi in preparation for Julius Caesar. And had Yeats himself travelled to Tir na nÓg as a preparation for his esoteric dramas, O’Casey demanded. The battle lines between the two men were firmly drawn. Furthermore, as well as having family members fighting in the war, O’Casey had talked to soldiers returned from the Front. In 1915, he was hospitalised with TB in St Vincent’s Hospital. The wards were thronged with wounded soldiers newly arrived from France. While recovering O’Casey recalled listening to accounts of the “slime, the blooded mud, the crater and the shell-hole” that had become “God’s kingdom on earth”. These first-hand accounts must surely have inspired the nightmarish visions of the second act of The Silver Tassie. But Yeats insisted that the play lacked unity of action. After its rejection by the Abbey, The Silver Tassie did find a home. It was premiered in London at the Apollo Theatre in 1929, starring Charles Laughton and Barry Fitzgerald. But the war between Yeats and O’Casey was to continue for several more years. They eventually patched things up and The Silver Tassie was staged at the Abbey in 1935 but the relationship between the two was never quite the same again. As for Bella, who had seen her husband and brothers serve with the British Army and her son fight in the war, she was the only member of the family who did not survive the First World War. On January 1, 1918, she died of the effects of influenza. This was the beginning of the Spanish ‘flu epidemic that was to sweep through Europe that year and claimed more victims than the hostilities did.